What it is: A mineral based, Canadian cosmetic line SST that delivers high-quality products formulated without chemicals like parabens and talc. These products are not tested on animals. The latest collection, Powerplay Powerstay, consists of an eye pencil, lip pencil and brow pencil that promise stay-all-day colour. 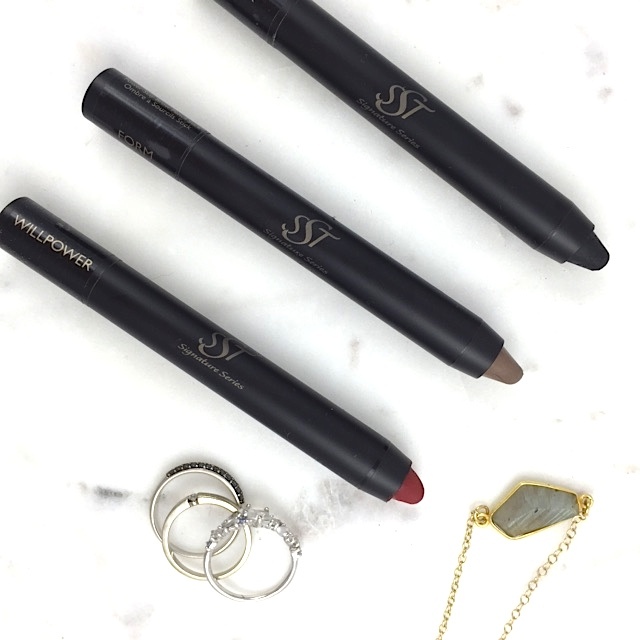 Beauty bonus: Nary a feather in sight with this high-impact lip colour! Beauty bummer: While the shadow stick was very creamy and easy to apply, we wished it would turn more powder-like post application. It stayed a bit greasy throughout the day. Overall: Three pencils to streamline our bulging beauty bags? Sounds like a dream. Cosmetics that are formulated with skin protecting antioxidants? Even better! We loved the brow pencil — it looked natural, was easy to apply and didn't budge all day. The lipstick was fantastic, the colour was super flattering, the texture was creamy on and it had some serious staying power — as promised! As with all mattes, a little lip prep was needed to achieve the best results (hello, lip scrub!). As mentioned above, the shadow stick left us a little disappointed. The formula didn't set as well as we would have hoped, but it certainly did stay put. With these shadow pencils, makeup remover is definitely required. Would I recommend? Brow and Lip colour — yes! Shadow stick — probably not.